Two years ago I saw David Suzuki speak on his tour across the country. 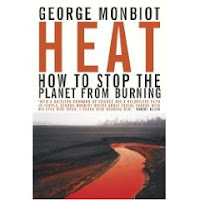 He mentioned one book that he felt was most important for people to read: Heat by George Monbiot. Then a few weeks later, Stephen Lewis came to town. He's one not to miss. Although he was primarily talking about the AIDS crisis in Africa, he was entertaining and engaging through-out his speech. It could have been so depressing that people would have to shut down to cope, but not with Lewis' stories along the way. Then he said, if there's one book you read on environmental matters, it should be Heat by George Monbiot. So I read it. It's full of well documented information and some brilliant ideas for stopping the problems we've caused over the last couple of centuries. It's long and dense, but very readable (at a desk, not on a beach). This synopsis includes page numbers for easier reference. Rationing begins with a decision about the amount of carbon the world can safely emit every year. Then divide that figure by the number of people on earth. Each country would then multiply that figure by the number of people it contained, and this would become its national allocation. It would keep some for running hospitals, food transportation, etc., and the rest would be evenly distributed to citizens in the form of a new currency called “icecaps” to be used to buy personal gasoline and household heat and electricity. It might be distributed in the form of a debit card that would get icecaps added monthly. But once the monthly allotment is gone, no more gas is available. So people would be forced to conserve. If you crank the heat, you’ll have to walk to the grocery store. But if you’re careful, you should have as much fuel as you really need. A rationing system would provide a permanent incentive to seek out better equipment, etc. It sounds scary, but along with this system will be a massively accelerated program to improve the condition of the poorest people’s homes to make them significantly more energy-efficient. And a better transit system must be created. The poorest people should not be faced with a choice between food and energy. Cutting carbon emission will actually make us money, as the requirement to invest in new technologies will stimulate economic growth. In 2005, the wholesale price of natural gas rose by 75%. This is roughly 28 times greater than the rate of increase in energy costs expected by the proposal outlined in this book. “If we in the rich nations do not act to prevent climate change, we are likely, in the next twenty years, to have more money in our pockets than if we do. We could spend that money on cars, flights, Barbie dolls, roads, and wars. In either case, it is hard to see how these delights will compensate for the damage to our lives that climate change will cause. - spent fuel must be set in cast iron, encased in copper, and buried in a deep hole that is then filled with a kind of clay; then it would be fine for a million years. - it was difficult to get electricity from the ocean to cities, but we can now use high voltage direct current cables which will change the world because the economies of scale permitted by massive development attached to long-distance cables means its price could fall by 40% in 10 years. Wind and Solar together need to be supported by other forms of power. The variable nature of wind and waves and other renewables means that though we might build many gigawatts of renewable generating capacity, we cannot retire a corresponding amount of power stations that burn fossil fuel. We’ll have to carry the cost of maintaining them. (For every 8 GW of wind farms, we could only shut down 5 GW of an old fossil fuel plant – and there’s diminishing returns as we go.) But, even though the old plants still exist, they would only need to run a portion of the time, so they’ll burn far less fuel than currently. - 2 -10% of electricity used is from “phantom loads” – equipment in homes and offices left in standby mode, plugged into the wall but not operating. Many appliances need to be unplugged in order to stop using electricity. Over 80% of the energy residences use is in heat. We must make houses that are better insulated. Germany created the passivhaus which has no active heating system. It takes advantage of the sun to passively heat the house through large south-facing windows in a well-sealed building so heat can’t escape. We need to make this type of building mandatory by strictly regulating the building codes on all new construction, and subsidizing retrofit work. They use a heat exchange system in which cold air entering the house is passed over the warm air leaving it. Houses like this save 79% in energy, and cost only 7% more to build (but are all but impossible to retro-fit). - Micro power systems in which every household is linked to its neighbours to form a miniature version of the national grid, connected to surrounding micro grids to offer more security. If someone’s generator fails, others can fill the gap. - The micro-generation system using solar panels and either hydrogen boilers or hydrogen fuel cells would supply their heat and electricity. - Half the grid-based electricity could be supplied by a few very large power stations burning methane from natural gas or underground coal gasification and burying the carbon dioxide they produce. The other half could be provided by offshore wind. - We need dedicated bus and bike lanes to make those options more attractive. - We need to cap and ration the road space we use. - Some cars sold 20 years ago were 40% more efficient than today. - Biofuel from agriculture will precipitate a global humanitarian disaster as space for food runs low. There’s a finite amount of agricultural land. (We can make biofuel from garbage.) People are cutting down trees to grow rapeseed for fuel, which is destroying habitats, and lowering carbon absorption from the trees. - Electric cars are efficient and can be used long-distance with a battery swap program in which motorists can go to a station to swap a dying battery for a fully charged one. - Drive less: The 40:40:20 rule – 40% of car journeys can be made by bicycle, foot or bus right now, 40% could be made if public transport and trails improved, and 20% cannot be swapped. - People overestimate the time a bus ride takes by 70% and underestimate cars by 26%. - Work from home more, and create a 4-day work week where possible. - Car pool, and drive slowly. - Shop by phone so stores turn into warehouses and fewer vehicles need to transport food. PLEASE VISIT MY WEBSITE AND FOLLOW ME AS A FRIEND AND ALSO SEND SOME COMMENTS ON MY POSTS. There is a chance you are qualified for a new government sponsored solar energy rebate program. Breaking News: Climate Change is Unhealthy!